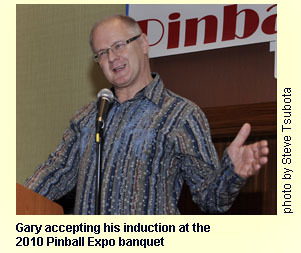 It was my pleasure, at the recent Pinball Expo 2010 Banquet, to induct Gary Flower into the Pinball Expo Hall of Fame. I welcomed the opportunity to return the honor as he served as my inductor at last year�s event. As most PGJ readers know, Gary has served as the Foreign Bureau Chief for the magazine since it began in May of 1991. However he has been much more than that. He as been an integral part of every issue I�ve published during the past nearly 20 years and has contributed information based on his knowledge of the pinball hobby, industry and their histories. 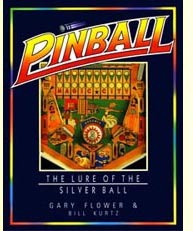 It occurred to me that what most readers don�t know is just how involved Gary has been in pinball and for how long, so I thought this would be a good opportunity to remedy that. Gary has been connected to pinball even before there was a Pinball Expo. He first rose to prominence in the pinball community back in 1978 when he was elected Chairman of the Pinball Owners Association in Great Britain. Under his leadership and guidance, membership in the organization increased threefold. He is perhaps best known in the USA as the author of the classic pinball book Pinball: The Lure of the Siverball published in 1988. This one book has since been published many times and translated into many other languages for a total publication figure that numbers in the hundreds of thousands. He wrote a regular column for both Amusement Business: Europe and Computer and Video Gaming magazines as well as penning articles for many other publications. He has published a second volume on the history of pinball, on CD, under the title Pinball Dreams Deluxe and most recently contributed A Brief History of Pinball for the Souvenir Program of the R3PLAY Show taking place in Blackpool, England. Gary is a long time supporter of the Internet Pinball Database and due to his extensive knowledge of pinball, he is called upon to conduct research into various aspects of interest to IPDB readers. Along with his involvement in published works, he has assisted with a number of pinball film productions as well. He appears in the forthcoming feature length documentary �Special When Lit� about the pinball hobby: �Gary was extremely generous in introducing us to the designers, manufacturers and fans in the pinball community the world over, our thanks and gratitude go out to him." --Clayton Jacobsen, Producer Special When Lit. Gary has played in a multitude of pinball tournaments over the years and has won many. He is reigning Pinball Wizard from 1984 to 1986. 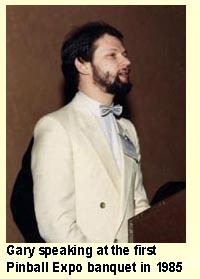 He helped with the launch of the first Pinball Expo in Chicago in 1985, traveled from London to speak at the first Expo banquet and has been a part of every Pinball Expo since. In recent years he has become the official host of the popular Fireside Chats. He has attended a number of other shows in the US both in the hobby and industry. Recently he has been a speaker at both the Pacific Pinball Exposition and the NW Pinball Show in Seattle. At home in the UK he is constantly involved in the planning and execution of events and takes pride in organizing and hosting appearances by major pinball personalities like Steve Ritchie and Dennis Nordman. He continues to offer his support to the South Coast Slam and the UK Pinball Party to be held in 2011.